At the Le Letty campsite, L’Oasis is a real institution. A meeting point for a multitude of holidaymakers who come for refreshment on the terrace here, L’Oasis is a unique location, a bar-pub with a convivial atmosphere, where you can also have something to eat, provided by a snack bar - pizzeria - takeaway, located in the vicinity of the bar. You can also have fun by attending a multitude of lively evenings, organised by our team or indeed by outside contributors! L’Oasis, the bar-ice cream seller on our Bénodet campsite, occupies a former barn, fully renovated and converted into a pub. Its panoramic terrace offers an unrestricted view over L'Aquatropic, the Le Letty aquatic park. Each day, you will have the chance to have a drink, enjoy an ice cream, but also to savour dishes prepared by our snack bar – pizzeria - takeaway. Of prime importance to our team is the concoction every day of the season, for lunch and evening meal, of quality starters, cooked dishes, pizzas and desserts to take away or savour in the L’Oasis bar, or on its panoramic terrace. There is also an ice-cream seller on hand for you near the bar. Come and enjoy our ice creams prepared on site or our ice cream sundaes, at any time of the day. During your stay at the Le Letty campsite, come and have something to eat in a totally exotic setting. Our chef, Cédric, will offer you a varied menu which will delight your taste buds! To get there, you take the Chemin des Pandas (‘Pandas’ trail’) which links the heart of the campsite to the restaurant. On a safe path, which is inaccessible to cars, your little family walk will thus be even more delightful. The “L'Arbre au Trésor” restaurant is also the perfect location for a late breakfast or French afternoon tea, whilst you discover the leisure park. Sweetbreads and buns such as brioches, croissants and pains au chocolat, and cakes and pastries, will be on offer to you. Little holiday delights for the entire family! Free Wi-Fi within the “L'Oasis” bar. It is not permitted to consume drinks purchased off the bar premises (for example in the campsite mini market or elsewhere...), either in the bar or on the various terraces. 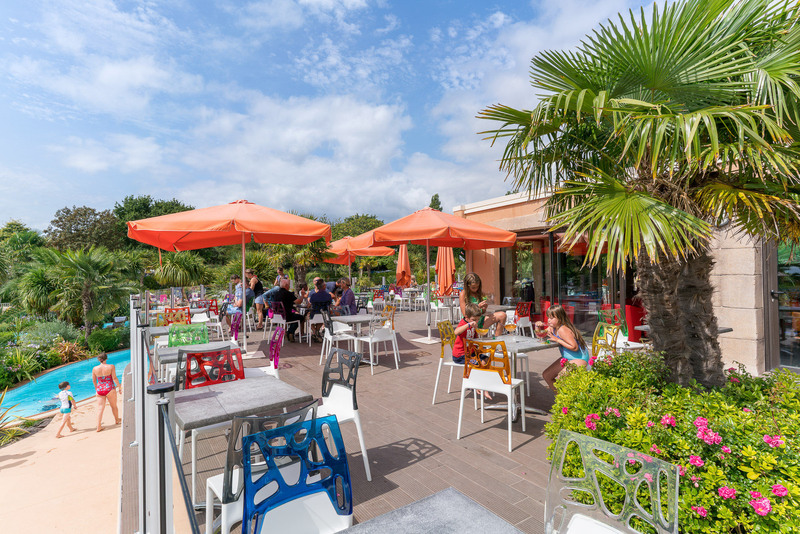 A safe path enables you to go to the “L’Arbre au Trésor” restaurant, located at the entrance to the campsite, next to the PandAventure Park leisure park. The restaurant is closed weekly on Mondays throughout the entire campsite season. An offering of snacks and French afternoon teas will be made available to you on such days. Picnics and rucksacks are not allowed. We do not accept animals in the restaurant. Free Wi-Fi, sockets and USB connections are available, for your comfort, during your meal or your French afternoon tea in the restaurant.